Two women were given the nature close-up of their lives when a wild bull elephant approached their veranda as they sat out in the sun. And quick-thinking photographer Marsel van Oosten made the most of the rare situation by capturing a holiday snap to remember. He was staying at the Lower Zambezi National Park in Zambia with his wife, Daniella Sibbing, when the African elephant came to introduce himself. 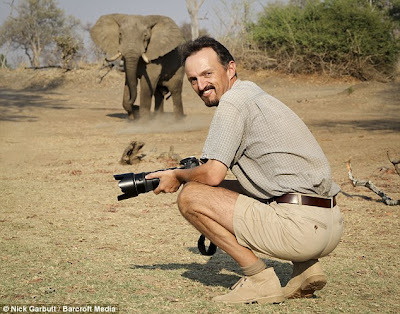 As Daniella and lodge owner Lana De Villiers sit motionless, for fear of being trampled, the 43-year-old aimed his camera and took the breath-taking shot of the beast. 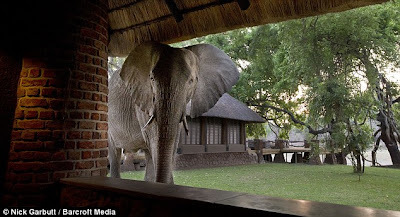 'The camp is located on the banks of the Zambezi River and set in a grove of Acacia trees which tower above the massive bull elephant that love feeding on them,’ said Dutchman van Oosten. 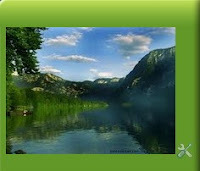 'They especially like the pods that fall from the trees and they actually shake the trees so that more pods fall down. 'The elephant in this shot was picking up the pods that were all over the camp, and slowly moved into the direction of the veranda. 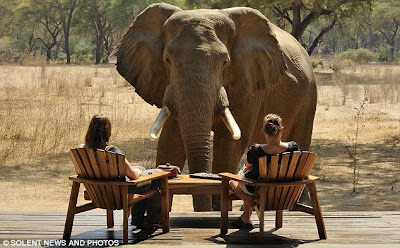 'It was the elephant that decided to move closer to the people, instead of the other way around - that was what made this such a special, if not slightly nerve-wrecking, experience. 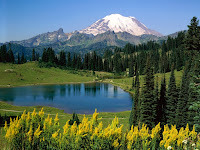 He added: 'I was reorganising my camera bag and cleaning my gear because it can be very dusty at times. 'When I saw the elephants approaching, I initially didn't see much of a photo opportunity as the light was getting quite harsh. 'But when this one elephant started to get closer and closer I quickly took my camera and positioned myself behind the women, hoping for the elephant to walk into the frame. 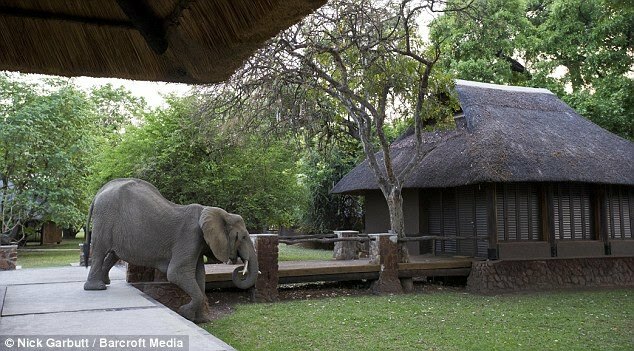 It's a similar story at the Mfuwe Lodge in South Luangwa National Park, also in Zambia, where the elephants are more regular visitors. The inside of the venue forms part of a traditional trail used by an elephant family for several years. 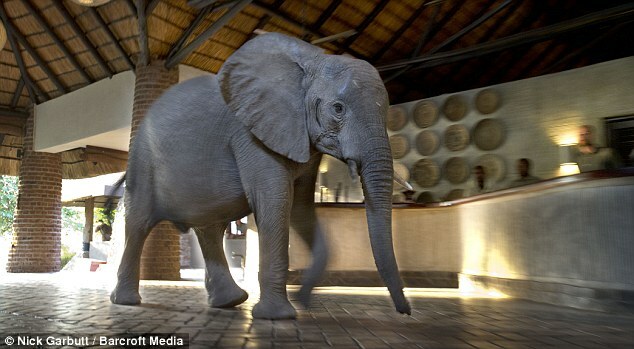 The unique spectacle occurs as up to 10 colossal African elephants stroll through reception on their way to their favourite mango trees inside the hotel compound. Hotel developers in 1998 unwittingly built the hotel on the well-trodden route favoured by the elephants - but it was of little importance to the powerful animals who simply walked through the building like they were guests. The herd marches to the hotel - and through it - at the end of October every year when the fruits ripen.